In 2003, a marked increase was observed in the incidence, morbidity and mortality of CDAD in Québec. Since 2004, considerable efforts have been made to control this infection. The mobilization of infection prevention and control professionals and the allocation of additional resources have made a difference, with CDAD rates falling to their lowest level in 2009-2010. Despite this significant improvement, CDAD outbreaks occur in most institutions from time to time. 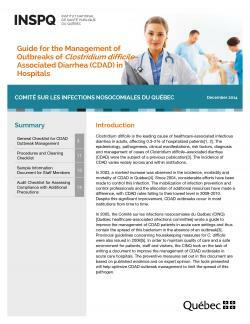 In 2005, the Comité sur les infections nosocomiales du Québec (CINQ) [Québec healthcare-associated infections committee] wrote a guide to improve the management of CDAD patients in acute care settings and thus contain the spread of this bacterium in the absence of an outbreak. Provincial guidelines concerning housekeeping measures for C. difficile were also issued in 2008. In order to maintain quality of care and a safe environment for patients, staff and visitors, the CINQ took on the task of writing a document to improve the management of CDAD outbreaks in acute care hospitals. The preventive measures set out in this document are based on published evidence and on expert opinion. The tools presented will help optimize CDAD outbreak management to limit the spread of this pathogen.